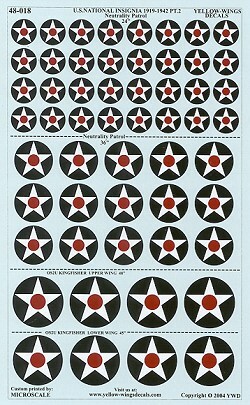 Continuing with Yellow Wings insignia sheets is this one for the US Neutrality Patrol. In addition to a goodly supply of 24 and 36 inch insignia for various aircraft, there are also sets for the OS2U Kingfisher with enough wing decals to do two aircraft. As is common with Yellow Wings decals, the research is absolutely first rate. In addition to a short history of the US Neutrality Patrol, there is pretty exact location information provided to allow you to use these on any of the aircraft that were in service at the time and might have been flying on these patrols. A number of small and large drawings are provided to give you a good place to start with these insignia. I really suggest that you pick up a set (or two) as Yellow Wing decals are very popular with those doing pre-WWII USN aircraft.